The Queens Museum invites young artists aged 7–11 to participate in our unique two-week summer camp. The Big Time Summer Art Thing for Kids is part creative laboratory, part arts gym and all fun! carefully designed to encourage explorations into the meanings of art and creative expression, while engaging in fun and innovative art-making activities. Campers will have many opportunities to explore and discover new and exciting forms of creative thought and expression. Art mediums covered will include painting with various mediums, drawing, book making, sculpting, collage, printmaking, ink painting, costume design, color theory, story telling, playing-card making, papier-mâché, marionette making, various and new puppet making processes and performance . The Queens Museum Big Time Summer Art Thing for Kids Team is led by experienced Queens Museum teaching artists, accompanied by a staff of gifted youth assistants from the Museum’s Queens Teens program and supported by the program manager. The Museum offers four different programs between July and August. Programs are for children aged 7–11 only. Feel free to register your child for one or more programs if you like. Each program runs Monday through Friday 9:00 am–4:30 pm. Lunch and drinks are not provided, however we supply allergen-free snacks! Campers will construct a costume that encapsulates a special power like space travel or mind reading. They will make instruments with everyday materials to enhance their costume. Campers will be inspired by Nick Cave’s sound suits and Mundos Alternos, the Sci-fi exhibition at the Queens Museum. This camp will explore color and its illusions. Campers will explore how colors affect emotions. Inspired by color around us in nature and in our city, they will experiment with a variety of art mediums like painting, drawing, printmaking, and sculpture. Campers will be inspired by Picasso, Tiffany Lamps, and Joseph Albers. Session III: ¡Mundos Alternos! Alternative Worlds! Sci-fi Art camp! 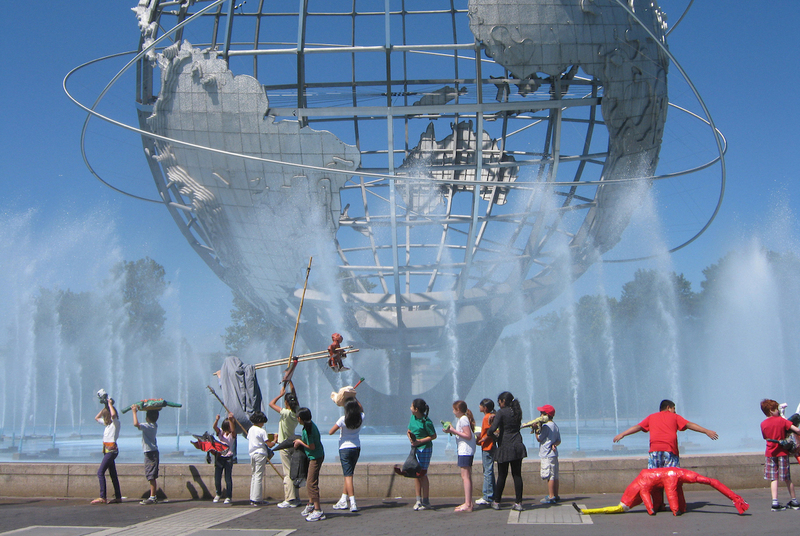 In this Sci-fi art camp inspired by Mundos Alternos at the Queens Museum, campers will travel to galaxies of their own imagining and create a series of artworks inspired by those worlds. Who inhabits these worlds? What stories do they tell? What do they eat for breakfast? To answer these questions, young artists will paint, draw, and sculpt their ideas, leaving camp with a collection of artifacts, literature, and even a deck of cards to prove that the universe they created may not be imagined after all…. Session IV: The Puppet Lab 2.0! Building upon the previous years’ puppet lab, young puppeteers will work with Puppeteer Greg Corbino to transform the art studio into a puppet laboratory for design, creation, and experimental performance of their own puppets. Campers will explore different styles of puppet-making including funky paper mache marionettes, wild sock puppets, and hand puppets made with surprising materials. Creative emphasis will be placed equally on puppet construction and puppet play in groups. We will use The Panorama of the City of New York as inspiration for puppet shows. The Puppet Lab 2.0 will culminate in short puppet experimentations to be performed for parents and families at the end of camp in the Queens Museum Theater. *We prioritize outdoor play, but if the weather is poor, campers may stay indoors and watch carefully selected films/animations that are connected to the themes of their art projects in the Museum theater. *A $30 late-pick-up fee will be incurred if the child is not picked-up by 5 pm. A $20 hourly fee will be incurred for every hour thereafter.